Karen Woods is a busy mum of three. 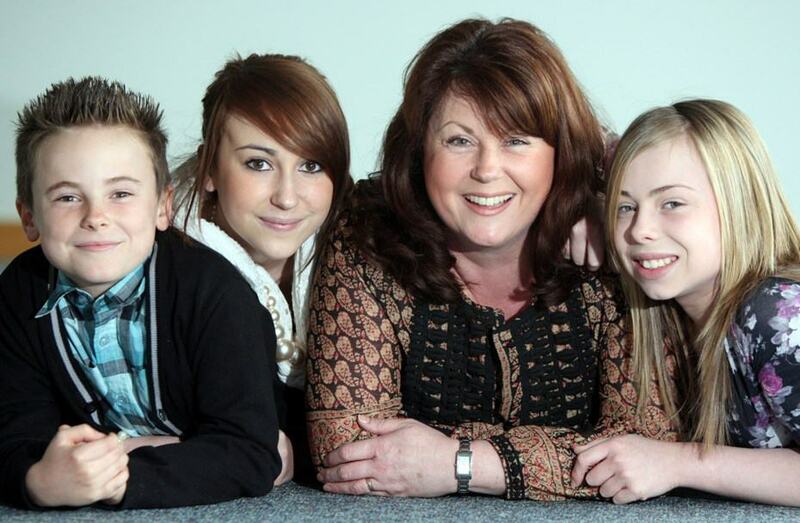 Having two children with severe nut allergies has inspired Karen and her husband Mike to establish Just Love Food Company, a company specialising in the production of delicious nut safe food. The company is launching this month with two children’s birthday cakes which are available in 200 Sainsbury’s stores nationwide. Aged four, my daughter Danika was diagnosed as having a severe nut allergy. She had been suffering with eczema for a couple of years and had been taken into hospital one weekend after her skin had become infected. A couple of weeks later I had a phone call from the doctor, who had routinely taken some blood, to inform me that Danika had a severe nut allergy. Lots of testing followed as we discovered that Danika was severely allergic to most nuts, the worst being peanuts. Epipen training followed and testing to our two other children. Our eldest was ok but our son who was two also tested positive to nuts and peanuts – hearing that was devastating and a complete shock. Initially we found it very difficult adapting our lifestyles to cope with these nut allergies. While many may think that it would be easy to adapt, introducing a nut free diet for the whole family was to begin with a challenge. Every time we went food shopping we had to check the ingredients list of the items we were purchasing and this continues to this day as many items change their allergy warnings on an ongoing basis. Going to restaurants was also difficult, as was going to family parties. As the children grew up, it didn’t get much easier, particularly when the children were invited to friend’s houses for tea. Not only did the parents of friends have to be shown how to administer an epipen, but they also had to check all foods that they were cooking for the children to make sure they didn’t contain any nuts. Birthdays were a particular struggle as it was difficult to find cakes on the market for those with nut allergies. All of the supermarket cakes carried “this product is not suitable for nut allergy sufferers” warnings. Last year, my husband, who had worked in the food industry for the past 20 years had the idea of developing a business that produced nut-free produce. Using his contacts, experience and knowledge of the food sector together we set up The Just Love Food Company which became a reality this year. What have you learnt about yourself since you started the Just Love Food Company? I was previously self employed as a beauty therapist before giving up work to have the children so working for myself isn’t a new thing. But I have enjoyed seeing the business develop from an idea to the reality it is today. The biggest challenge so far has been to get the ingredients from nut free sites, and to convince retailers of the need to provide nut free solutions. There is still a long way to go before retailers are providing good ranges for people with allergies, but at least things are moving in the right direction. We have been fortunate to secure an exclusive deal with Sainsburys who are going to stock our cakes. Like us, Sainsburys can see a gap in the market for the supply of nut-free products and can see our vision of making fabulous food products that provide solutions for those with allergies. We don’t believe it should be a fabulous product or a product that suits those with allergies. We believe we should make delicious food that allergy sufferers and food lovers alike can enjoy. In order for the supermarkets to sit up and take notice that there is a need, I would urge shoppers to keep asking in stores and requesting that they provide products for people with allergies. Best bit about being your own boss, is that you are in control of the direction your business is going in. You can be true to your own beliefs and ideals without making compromises. Family and friends have been hugely supportive and of course none of it would have been possible without the financial support from Natwest and Finance Wales. We have had supportive letters and emails from people who have read our newspaper articles, this is fabulous and will keep us going as we know we are doing the right thing. We want to make a difference and provide a solution to help the parents, families and friends of those with allergies. The company’s vision is to be a major player in the food industry, making fabulous food products AND providing solutions for those with allergies. We don’t believe it should be a fabulous product OR a product that suits those with allergies. We believe we should make delicious food that allergy sufferers and food lovers alike can enjoy. The Just Love Food Company is in its infancy. We are starting with children’s celebration cakes but it won’t be long before we are branching out into different markets and product ranges. We already have lots of new product ideas up our sleeves and are busily perfecting the recipes so that when our customers finally get the chance to try them, they’ll be delighted! Do something that makes a difference, be true to your own beliefs and ideals and be passionate. If you are passionate about what you believe in then this will rub off on others.